The AP is reporting that U.S. Rep. Katherine Harris' third Senate campaign manager has resigned, citing the candidate's "increasingly erratic behavior and counterproductive, damaging statements." "It became unmanageable, unhealthy, uncontrollable," said Glenn Hodas, who became campaign manager in April. He said four other key staffers were also leaving. Harris' campaign has faced other problems. Fundraising has been slow and GOP leaders have pressured her to drop out in favor of another candidate. She has also been criticized for her connections to a corrupt defense contractor who illegally gave $32,000 to her campaign. She became a polarizing figure in 2000 when, as Florida's secretary of state, she certified George W. Bush's 537-vote win in Florida's disputed presidential election. You read that right. 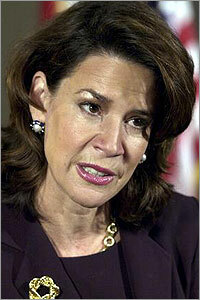 The woman who gave President Bush his job back in 2000 is now running for Senate. And the GOP is giving her a hard time. Either she's made some rippin' enemies between then and now or else...uh...hmmm. I can't think of another reason.